Alex Rodriguez is arguably one of the greatest players of all time. And throughout that time we have all seen a player at the highest footing of a pedestal, and back down to its lowest dungeons. After all the stories and scandals about friction with teammates and management, or steroid use, or attempting to sue the Major League Baseball Players Union, we are now witnessing a man at the end of his career. 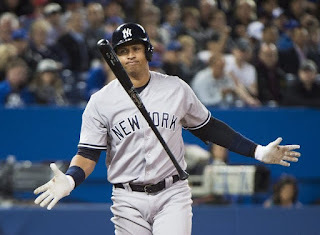 With a suspension for the 2014 season, 2015 was a resurgent year for Rodriguez, but Yankees fans reluctantly suffer amnesia when it comes to a particular player’s production, especially when that player is as polarizing, and makes as much money as Alex Rodriguez. There has been a large cloud looming overhead since the 2004 season when Rodriguez made his debut with the club. Most fans showed serious interest, curiosity and amazement at Rodriquez’s abilities with the Seattle Mariners and Texas Rangers prior to his arrival in New York. Sure, there have been some amazing years for A-Rod in pinstripes which resulted in two MVP awards, six All-Star game appearances, three Silver Slugger awards, two seasons of leading the AL in home runs, and a championship in 2009. But it still seems that this particular résumé is not answering questions for today’s issues with the team. As Yankee fans, there seems to be a, “what have you done for me lately” mentality. One might say that the idea of instant results is a bit unfair, considering the fact that Rodriguez had a successful 2015 campaign (33 HRs, 86 RBIs, and a .486 slugging percentage in 151 games). The moral of this story is that A-Rod is a player that makes a lot of money and plays for a mediocre team that probably is not going anywhere significant this season. He is owed $21 million this season as well as in 2017. If you are the Yankees front office, do you let him play out the last year of this contract and allow him to take up the roster spot or do you eat the $21 million, let him walk, and consider his spot as another opportunity for the organization to continue its journey towards youth development in 2017? It is not an easy question to answer considering the money that is in question for both 2016 and 2017. If I were running the show in the front office, I would cut Alex and eat the money. This season has been a career worst for Rodriguez which can be attributed to his age, as well as nagging injuries with the knees and hips. A season like 2015 will likely not be seen again by A-Rod based on the said injuries and father time. He just can’t handle the day in and day out grind of a 162 game season anymore. Currently, he is hitting .220 AVG, with 8 HRs, and 28 RBIs in 51 games played this season. He can’t run anymore (Michael Kay mentioned on his radio show that it takes him about 4.6 seconds to get from home to first), can’t field, and management feels that he can no longer handle right-handed pitching. Considering the previously mentioned factors/statistics it would be smart to consider eating the last year of his contract and offering well wishes on the future. What choice do the Yankees really have moving forward? It is not entirely Rodriguez’s fault that he was offered a lengthy and pricy contract. The Yankees organization offered him that contract, and if they want to finally put this circus show to rest then they will part ways with him. I am sure that most Yankee fans appreciate the season that A-Rod had last year, but that is in the past and as of right now A-Rod is merely taking up space. Is that a bit harsh? Perhaps, because he is not the only major flaw on this Yankees squad this year. The Yankees have other issues including a lack of consistency from the rotation, lack of efficiency from the bullpen (other than Dellin Betances, Andrew Miller and Aroldis Chapman), and a lack of production from many important players. There are too many issues for a team that expects to win every year. But Rodriguez is a polarizing athlete and one of the greatest players of all time, so anytime the notion of a player of his stature lacks the skill and physical prowess to do his job then it becomes a big deal and a big story. I hope that the Yankees can make the sensible choice here. A-Rod is one of a few players that holds the roster down because of his age and injury history. It would be no different cutting him either this season or next. I think it is safe to say that the 2016 New York Yankees are in fact playing for the 2017, if not beyond. If that is the case, then there need to be major changes made including serious minor league call-ups. Until then, we can only wait and see at this point.